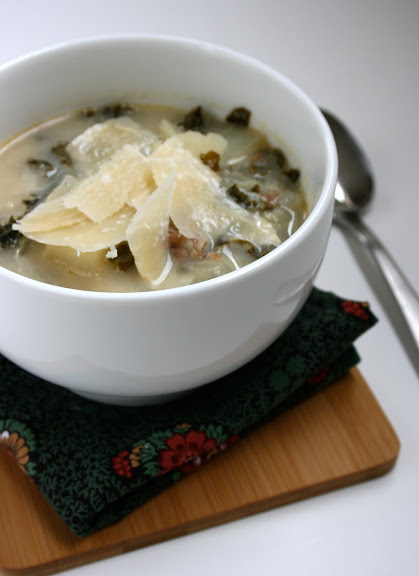 My sisters-in-law all make a variation of this soup and all of them are delicious. I've discovered it's just a matter of how much of this or that you like. My favorite aspect (besides how yummy it tastes) is that it incorporates kale, which is apparently one of the most nourishing vegetables around. Oh, and did I mention your kids will love it? I've seen some pretty picky eaters down this soup. How 'bout that? You can find the recipe over at Zupas today. I am so glad you posted a soup recipe today! It will come in handy this week. It is still so cold and wintery in IL...dreaming of pansies and daffodils. Mmm, thank you! Looks delicious! i would like to be eating this right now, please. 1. Do I chop the onion? 2. Potatoes - russet, yukon gold, any variety? Thanks for the recipe - it looks delicious. that looks absolutely delicious! i may just have to make that for dinner tonight! thanks so much for sharing, and i hope you're having a lovely week! Made it for dinner...and it was beyond excellent. Only I used fresh spinach because my tiny grocery store didn't have kale. I just made this and subbed spinach as well (I am drowning in it, thanks to my CSA). LOVE it, thanks for a great recipe! i just made this recently! so yummy! You bet Sara. Zupas is having trouble with their site and subsequently messing up all my links :( If you ever have trouble and can't get a hold of me, just add "cafe" in front of "zupas" on the link and it will go to the right place.